Buddhism is one of the many religions of India that teaches us the philosophy of life, meditation and helps us practice and develop spirituality. From the Magadha era, Buddhism has risen and spread all throughout India by Siddhartha Gautama or the Buddha. 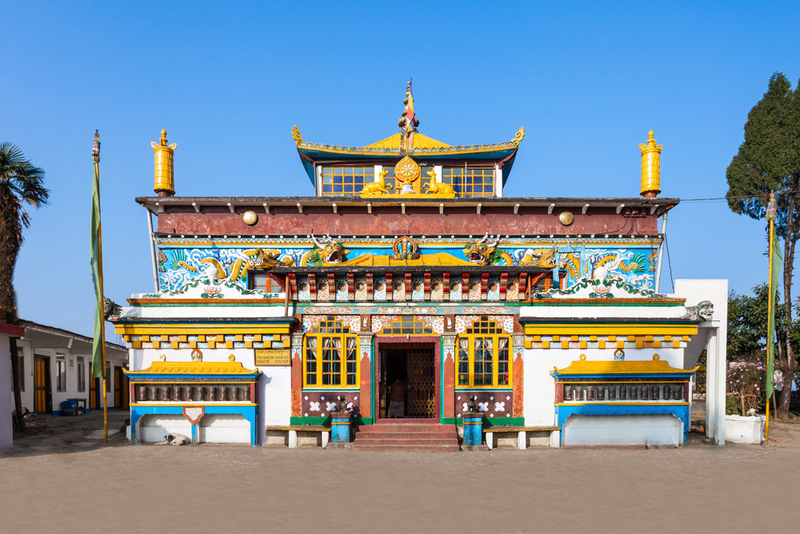 India hosts many Buddhist Monasteries, which are spread in various corners of the nation. The monasteries are also summoned as Gompas. They are not just sacred sites for the Buddhist followers but also architectural gems, which one might think of exploring when in India. Listed below are some of the famous Buddhist monasteries in India. The Namgyal Monastery is situated in the district of Dharamshala in Himachal Pradesh. This monastery is one of the most famous tourist destinations in this region of the Kangra Valley and McLeodGanj. The Dalai Lama founded the Namgyal Monastery himself. The Monastery has passages in its interiors that only Dalai Lama and his selected disciplines use. The monastery is located in the middle of lush green forests of cedars, oaks, and pines. From the monastery the beautiful views of the Dhauladhar ranges are visible. The monastery premises also comprises of a Tibetan museum, a book shop, cafeteria and a library. Around 150 students reside in the Gompa and study Buddhism, Sutra, and Tantra. How to reach: The nearest airport is the Gaggal Airpot, which is at a distance of 15 km from the Monastery. Pathankot is the nearest railway station at around 20 km. The city of McleodGanj is connected well by roadways to Shimla, Dharmshala and many other cities. Tawang Monastery in Arunachal Pradesh is one of the largest Buddhist Monasteries in India, and in Asia it is the second largest. Meral Lama Lodre Gyamtso was founded during 1860-61. It is the heart of the Lamaistic faith from the Mahayana school of Buddhism found in the northeastern parts of India. 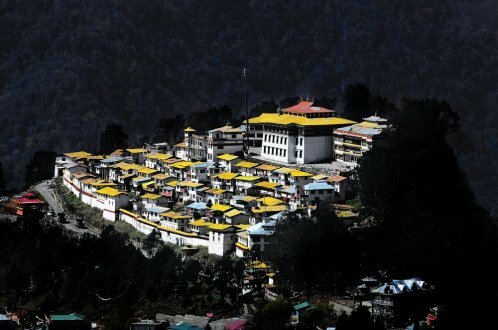 The monastery is located at a height of 10,000 feet; and from here, you can see the stunning Tawang-Chu valley. How to reach: Solanbari airport located in Tezpur is the nearest airport. Ranapara rail station in Tezpur is its closest rail station. Private companies and Arunachal Pradesh State Road Transport Corporation (APSRTC) run state buses can take you to Tawang from Bomdila. 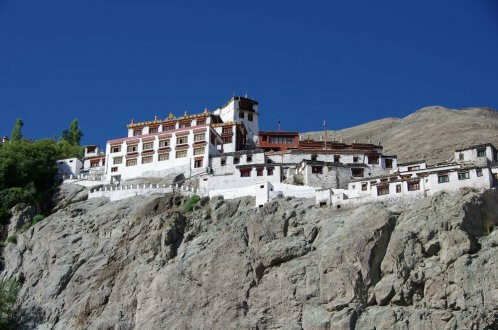 This monastery is located right within the picturesque view of the Nubra valley in Ladakh. The Diskit monastery in Ladakh is the oldest and also the biggest in this region. 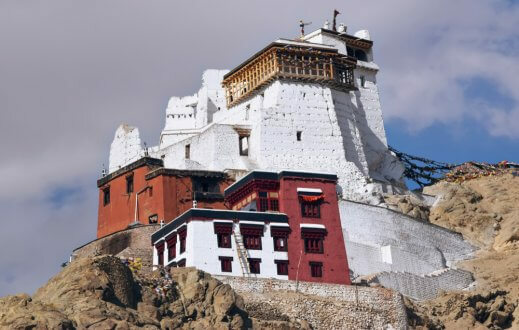 It was built in the 14th century and belongs to the Gelugpa sect of Tibetan Buddhist order. It is a spectacular Gompa with a Maitreya statue and a huge drum located in its prayer hall. Many shrines adorn the monastery with the largest being the 32-metre tall Jampa Budha statue looking right over the Nubra valley. How to reach: Cab services can take you to the monastery from Leh. The journey will take you 5 hours. The Mindrollling Monastery is located right in the foothills of the mighty Himalayas in Dehradun, Uttarakhand. 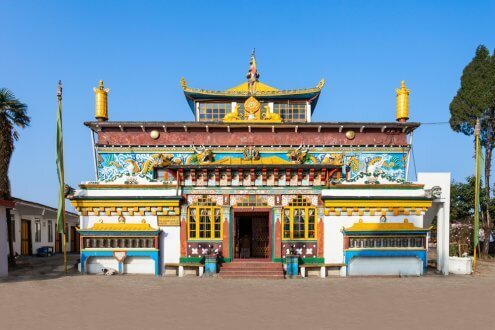 In the year 1676, this monastery was founded by Khochhen Rinpoche; and today it is considered as one of the best centres where Buddhism scriptures are taught along with many other academic courses. The name “mindrolling” itself signifies that the monastery is the ideal place for perfect emancipation. The monastery architecture is grand with the 60m tall “Great Stupa” which one of the tallest in the world. The Stupa comprises of different shrine rooms showcasing murals, Tibetan art, and relics. The main presiding attraction is the gold Sakyamuni Buddha Statue which is 35m high and is made to dedicate it to the Dalai Lama. How to reach: Dehradun railway station at a distance of around 9 km is the nearest rail way station. From Clement town you have to book a bus or a cab service to reach the monastery. 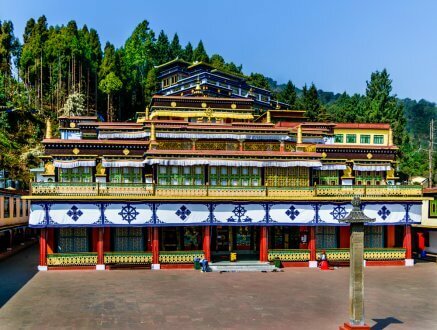 The Ghoom Monastery is located in Darjeeling and is summoned by the locals as the Yiga Choeling Monastery. The Monastery was built in the year 1875 by Sherab Gyatso, a Lama. 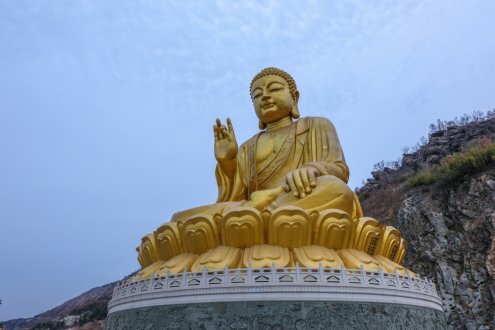 It is situated at an altitude of 7470 ft and has gold and precious stone adorned statue of Lord Buddha which is around 15 ft high. The monastery preserves some of the famous handwritten manuscripts of the Buddhists. Monks in this monastery follow the Gelugpa Buddhism order. How to reach: Ghoom Monastery is located at a distance of around 8 kms from Darjeeling. A cab service can take you to the monastery from the centre of Darjeeling. The Rumtek Monastery was formed in Tibet in the 9th century; and later in the 1960s, the monastery was re-established in India. This is considered as one of the grandest and vibrant Buddhist monasteries in India. It is a must visit place if you are in Sikkim for your travels. The monastery is located at an altitude of 4900ft and is around 24 km from Gangtok city. How to reach: From Gangtok, you can hire a cab to reach the Rumtek Monastery. The charm of Buddhism is unique and when explored you can find immense happiness and peace right within yourself. When travelling to India, you can plan to visit some of the above monasteries to feel the rich tradition and culture of Buddhism.